BioKlean Soft - gentle preparation based completely on natural ingredients deriving from organic farming. Useful for every household task. Cleanses, refreshes and ionizes environment by displacing infective microflora and implanting useful probiotics. 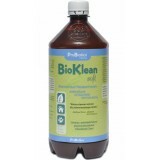 BioKlean Soft - gentle preparation based completely on natural ingredients deriving from organic farming. Useful for every household task. Cleanses, refreshes and ionizes environment by displacing infective microflora and inoculating useful probiotics. It has wide range of use, safe for every type of a surface.